Summary: We love sparkling apple cider, but many commercial products are made with high fructose corn syrup and preservatives. It's actually quite easy to make your own with your at-home soda machine, or store-bought carbonated water. This is perfect for New Year celebrations, or any other celebration where you'd like a little non-alcoholic bubbly to sip. We love sparkling apple cider, but many commercial products are made with high fructose corn syrup and preservatives. It’s actually quite easy to make your own with your at-home soda machine, or store-bought carbonated water. This is perfect for New Year celebrations, or any other celebration where you’d like a little non-alcoholic bubbly to sip. estimation). Bring the water to a boil, then reduce to a simmer. Allow the apples to simmer until they’ve become mushy, stirring constantly to avoid burning. This could take up to 20 minutes, so be patient. out) and simmer until reduced by half. You now have apple concentrate. 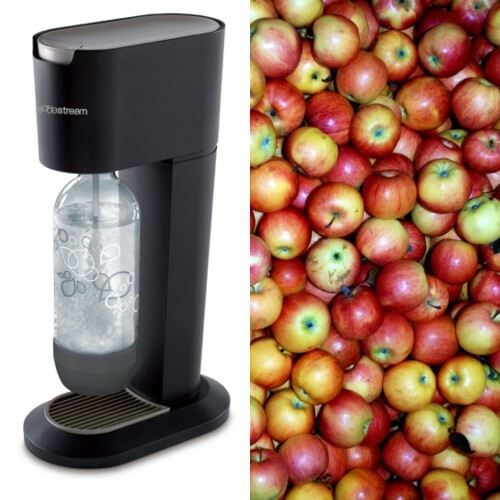 To make sparkling apple cider, simply carbonate water as you would to make any soda. In a pitcher combine the sparkling water with the apple concentrate in a 3:1 measurement. If you like a stronger taste, simply add a little more of the apple concentrate. For a fun and elegant presentation: fill champagne flutes with the sparkling apple cider and add a few berries of your choosing to the glasses.